Rumours that Hewlett-Packard is planning to develop its own cloud-based music and movie offering are gathering a head of steam this week. The latest suggestions that HP is developing its own cloud-based entertainment service to take on the likes of Spotify, Apple iTunes and Amazon come from a leaked presentation published over on PreCentral. 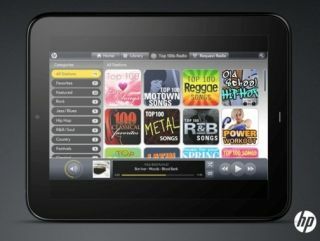 HP is said to be developing its new cloud locker service for its forthcoming webOS-powered TouchPad tablet. The leaked HP document references the HP Music Store and the HP Movie Store, with some interesting details on the music store also included. HP's TouchPad will allow users to sync and remotely store their own music, as well as using a clever algorithm, which will keep the music you listen to most often on your device, much like Spotify gives you the options of downloading certain favourite tunes to your smartphone, tablet or laptop/netbook (but doing this for you automatically, by the sounds of HP's leaked info). It's a fascinating concept and, if HP manages to pull it off, it may well give them a significant competitive advantage in the increasingly important (and increasingly competitive) music streaming market. HP's new streaming service may well also be extended to stream music to webOS 3.0 smartphones in time, according to the leak.